Cactus plant belongs to Cactaceae family. It has more than 2000 varieties which are found in different colors, shapes and forms. Some unique features of cactus plant are as follows: The cactus species is known as succulents as its organs: the stems, roots and leaves, store water for the plant so that it can survive in the drought period. This is possible because the spongy tissues of its thick, fleshy green stems can hold water during the rainy season. Then, it forces the water down into the roots and do not let it come to its surface. It performs the function of the leaves and carry out the photosynthesis process. The stem is also coated with a waxy substance that can prevent evaporation of water. When we think of cactus plants the first thing that come to our mind are its spines which are nothing but its leaves. 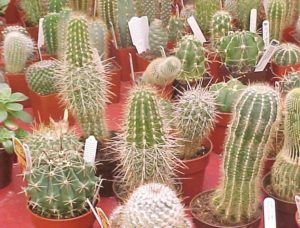 The spines of cactus results from its modified leaves and they grow from specialized structures called the areoles. The size of the spines can vary from species to species and they can be as long as 15 cm. As the leaves are shrunk, they prevent loss of water through transpiration. Some cactus spines are light in color which help them to reflect maximum sunlight and keep the plant cool. Another function of the spines is to protect the plant from birds and animals. They actually eat cactus only for water. These plants have an extensively complicated root system which enable it to absorb water from the soil. Strangely, even small-sized cactus plants have big roots. These roots are not very deep and may not extend beyond 10 cm below the surface of the ground. However, they often spread to wide areas covering almost 2 meters in diameter. The function of the roots is to anchor the plant well and obtain maximum underground water and minerals. Cactus flowers are big in size and are found in a variety of colors like red, yellow, pink, etc. Some of the cactus flowers can stand for many days and others may die within a day. Many of these flowers bloom only during the nighttime and some of them require daylight. The nocturnal blooming are primarily pollinated by bats and other nocturnal insects and animals. The lifespan of a cactus plant can vary from 25 years to 300 years. A unique characteristics is that it has periods of blossom and periods of rest. During the growing phase, the cactus requires direct sunlight, high temperature, humidity, proper watering for rapid growth. While in the resting phase, it should be kept in cold temperature, low humidity and needs once a week of watering. Pachycereus pringlei is the tallest cactus plant with a height of about 20 m (66 ft) and Blossfeldia liliputana is the shortest with a height of just a few centimeters. Some cactus are perfect round in shape and look like a barrel, other are flat or oval and looks similar to ears. Other unique shapes are that of chandeliers, curled snakes, starfish or wrinkled human face. One of the most impressive feature of cactus is that this plant serves as natural water reservoir. The liquid stored in it is not clear like water but a thick viscous substance. This liquid is absolutely safe for human consumption. It can be obtained for drinking by scratching or making a hole in the columnar cactus. This fluid has saved several lives in the desert regions. Contact us today at Orlando Outdoors!